One of the fastest retrieves in freshwater, the Aggrest offers an attention-getting 7.3:1 gear ratio. The mechanical advantage comes from tough helical-cut teeth on the oversized phosphur-bronze pinion gear and Dura Aluminum drive gear—the unique tooth angle locks in and delivers consistent full-speed-ahead power, with no slippage. Super-light low-profile design (weighs just 7.6 oz. ), rigid aluminum frame, six ball bearings including 2 CRBB, Magforce-Z anti-backlash system, click-adjustable high-performance drag. 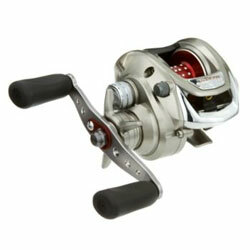 "Smooth Daiwa reel. Very fast gears! Great for flipping and pitching or topwater lures." ""I jumped on this reel early on because of the 7.3 ratio. Highly disappointed. I have two of them and both are very rough reeling and impossible to set the anti backlash. " "After a few cast the thumb bar does not fully engage and makes a really bad grinding noise... a horrible pitching reel... does NOT throw light bait with ease... not smooth... the drag is junk... "